Learning how to make tomato juice is fun and fulfilling, and the finished product is both tasty and healthy. The only ingredient required is fresh or canned tomatoes. 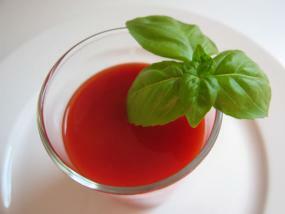 Tomato juice can be enjoyed on its own or mixed with other vegetable juices for a refreshing drink. The ingredients needed to make a quart of tomato juice are minimal. You can pick everything up at your local grocery store. To give a savory flavor to your juice, add one small chopped onion and two chopped celery stalks to the cooking tomatoes. 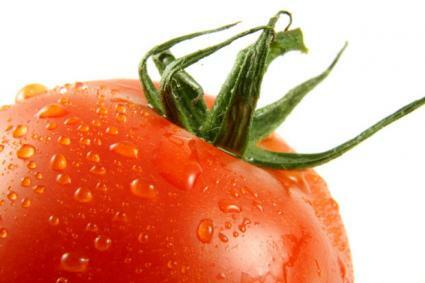 Wash all the tomatoes (if they are fresh) thoroughly and remove any vines or stalks. If you prefer to work with peeled tomatoes, blanche the tomatoes in boiling water for a minute or two until the skin splits, let them cool, and remove the skins. Core the tomatoes and chop them roughly, in quarters or in smaller wedges. Place a large saucepot over medium heat on your stove. If you want to add flavor to your finished tomato juice, pour a bit of olive oil into the pot and sauté the chopped onion and celery stalks until they become tender, about 8 to 10 minutes. Add the chopped tomatoes to the pot. Lower the heat and simmer the tomatoes for 25 to 40 minutes, depending on the finished consistency you want. A longer cooking time will yield a slightly thicker juice. Remove the cooked tomato mixture from the heat and let it cool for at least 10 to 15 minutes. Pass the tomato mixture through a sieve or food mill to remove all tomato solids, the onion, and the celery. Chill the finished tomato juice for at least several hours before serving. Store any extra juice for up to several days in the refrigerator. Unless you like a thick juice that is somewhat lumpy and full of tomato seeds, you'll need to make your tomato juice with a super mixer type appliance such as a Vitamix, a commercial juicer, or a food mill. Using a standard blender or regular mixer won't remove seeds, skin, or thick pulp from tomatoes, so juice made with those machines will be thick and full of globs. A food mill can easily convert the cooked tomatoes to juice. Simply remove the cooked tomatoes from the heat, run through the mill, and return to the pot to add any desired seasonings. You can also strain finished juice through a sieve to remove solid components. Though using a sieve can be time-consuming, it may be your best option if you don't make vegetable or fruit juice at home very often. You can strain the reduced tomatoes through a mechanical strainer to speed up the process, but a plain metal sieve works just as well. If you do make fruit or vegetable juice often, you may want to consider purchasing an electric juicer to do the straining, pureeing, and sieving for you. Many models are available in a variety of price ranges. It's a snap to learn how to make tomato juice with an industrial mixer. You don't have to cook tomatoes before adding them to the mixer. Raw juice tastes fresher or lighter, and you can still add flavor to it with celery or other vegetables. Juice made in a Vitamix will be think because it contains all the fiber. All you do is add tomatoes and turn the mixer on. For a thinner beverage, strain before drinking. Following the instructions that came with your juicer, run about three pounds of fresh tomatoes through the machine for about one quart of juice. You don't have to peel the tomatoes before adding them, because the juicer will remove any solids before it releases the finished juice. Juice can be made from fresh tomatoes easily using a hand blender and a cheese cloth or nut milk bag. This involves simple blending the tomatoes and then straining through the bag into a bowl or jug to remove all solids. It may be beneficial to do this a few time to eliminate all chunks. Once you have the basic tomato juice recipe down, you can add in other flavors and components to make different fruit and vegetable juice cocktails. Try mixing tomato juice with orange juice, apple juice, or juice from zucchini, green peppers, spinach, carrots or other vegetables. Serve your finished juice cocktail with a fresh sprig of parsley, basil, or mint.